“The most effective way to destroy people is to deny and obliterate their own understanding of their history.” That quote, made by George Orwell, is a particularly apt phrase when looking at Denial, a movie that explores the libel case brought by Holocaust denier David Irving (Spall) against renowned historian Deborah Lipstadt (Weisz) and her UK publishers, Penguin, back in 2000. In her book, Denying the Holocaust: the Growing Assault on Truth and Memory (1993), Lipstadt had referred to Irving as a “Holocaust denier, falsifier, and bigot”, and also stated “that he manipulated and distorted real documents.” Irving sued Lipstadt in the British courts for one very good reason: in the UK, the burden of proof is on the defendant. In this case it meant that Lipstadt and Penguin had to prove that the Holocaust did actually happen, thereby proving that Irving was a falsifier and the accusations in her book were true. If you were around in the late Nineties, it’s likely you would have heard of David Irving. He was notorious for his denial of the Holocaust, and the very nature of the trial made it headline news at the time. In bringing this incredible true story to the screen, director Mick Jackson and screenwriter David Hare have managed to somehow make a movie that gets the salient points across but which does so with a minimum of apparent enthusiasm. Perhaps it’s the nature of the subject matter, and the makers have gone for a dour, unspectacular approach in recognition of this. If that’s the case, then they’ve done the movie a massive disservice. From the moment we see Irving challenge Lipstadt at one of her lectures, the very idea that the Holocaust didn’t happen – and that someone would willingly say such a thing, and then challenge someone to prove it did happen – is so bizarrely unnerving that it should make Irving all the more intriguing, and yet, as played by Spall, he’s more like a kindly uncle who’s gone slightly off his rocker. When he makes his opening speech at the trial – Irving represented himself – his off-kilter rhetoric and less than fashionable beliefs show a man whose disregard for historical truth has brought him to the last place he should ever want to be: in a courtroom, where his beliefs could be challenged under law and where his convictions could be exposed as terrible shams. Irving may have thought he was being clever bringing the case in an English court, but it was hubris that made him do so, and inevitably, he paid the price. It’s an aspect that the movie fails to grasp, instead highlighting Irving’s sense of self-aggrandisement, and his talent for being a fly in the ointment of accepted historical fact. 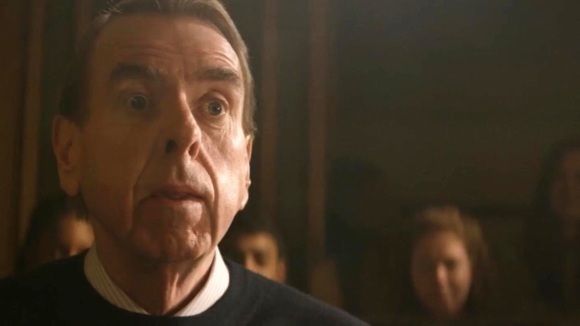 Spall is good in the role (when was the last time Spall wasn’t good in a role? *), but as written, Irving never appears truly threatening; he never comes across as someone who ever had even the slightest chance of winning, but the movie tries to make it seem as if he did. There are nods to the oxygen of publicity that encourages him in his efforts, but the real question that should be on everyone’s lips is never asked: Why? Why be a naysayer for the Nazis? With Irving filling the role of boogeyman to Lipstadt’s crusading historian, the movie settles back, happy with its principal villain, and finds itself struggling to make the defence team just as interesting. 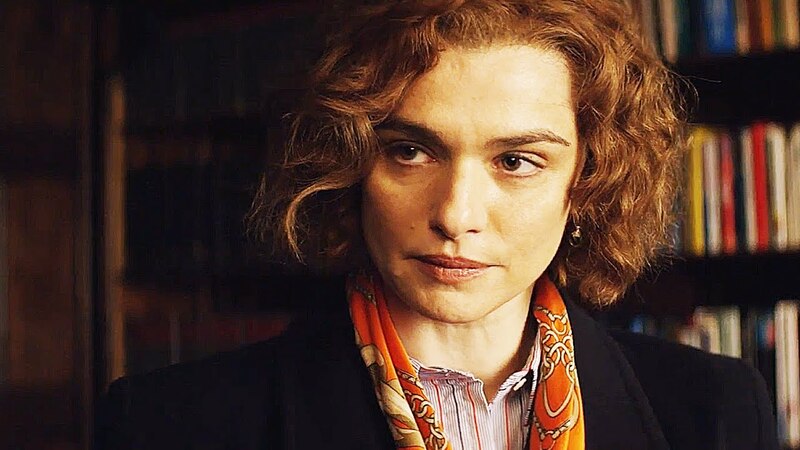 As Lipstadt, Weisz brings determination and passion to the role, but it’s directed too often in opposition to her legal team, headed by barrister Richard Rampton QC (Wilkinson), and solicitor Anthony Julius (Scott). She butts heads with them over how she thinks the case should be handled, questions their commitment, and then wonders why her passion isn’t as openly shared as she expects. Wilkinson bounces back and forth between carefree bonhomie and courtroom gravitas, while Scott essays patrician superiority at every turn, all of which leaves little room for the rest of the defence team to make much of an impact. In the courtroom, any expected fireworks fail to be set off. There’s so little tension, and so few moments where the inherent drama of the case is allowed a bit of breathing room that the viewer can only wonder if Hare somehow forgot that these scenes were meant to be gripping. The same could be said for Jackson’s direction, which relies on the same camera set ups throughout, the cut and thrust of Rampton’s cross-examination of Irving, and a last-minute inference from the judge (Jennings) that the defence’s case might crumble at the final hurdle to instil some heightened drama. But by the time it happens, most viewers will have ceased to care if Irving loses or not, just as long as there’s an end to the story. 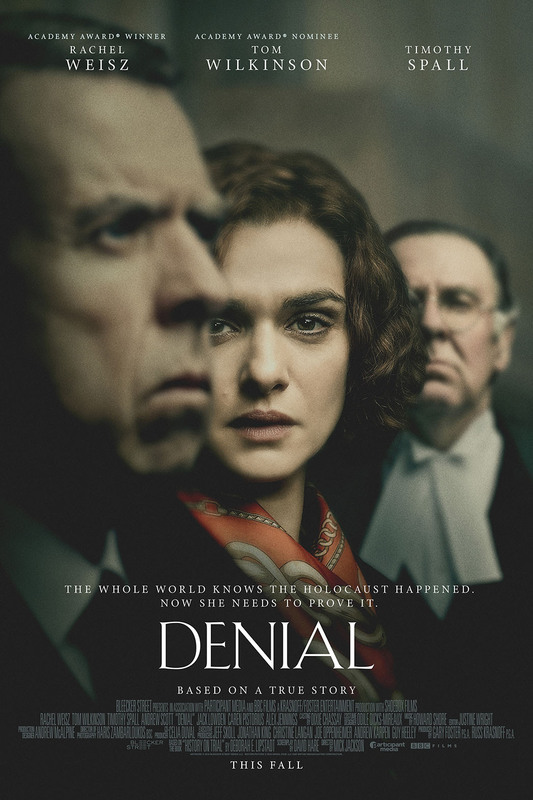 All in all, Denial works as a generalised account of an important moment in British legal, and Holocaust, history. But in taking the generalised road – the road most travelled, if you will – the movie loses any sprightliness it might have had, and resorts to plodding along, picking up plot points along the way, and under-utilising its very talented cast. It doesn’t fall down at any point; instead it lumbers along as if it’s about to. The only time it breaks free of its self-imposed shackles, is during a trip to Auschwitz, where Rampton appears to be insensitive to the surroundings. It’s a bleak, mournful sequence that speaks to how gripping the rest of the movie could have been. All in all, it’s not everyone’s finest hour, but it does do just enough to give people the sense of what it was like back then, with Irving seemingly unassailable and the very real possibility that Lipstadt might lose. But the movie’s dry, methodical approach undermines the material – and the performances – too often for comfort, and though this is a worthy piece, it never gains the necessary traction to make it compelling as well. Rating: 6/10 – not a straight up fiasco, nor a contentious thriller either, Denial falls somewhere between the two camps in its efforts to be absorbing and persuasive; a movie that could, and should, have been made as a legal thriller, it keeps a respectful distance from the horrors that Irving would have had us dismiss, and only really gets under its own skin when it’s at the real Auschwitz-Birkenau camp. *The last time Spall wasn’t that great in a role? Sofia aka Assassin’s Bullet (2012). Don’t check it out. In 1996, the Holocaust denier David Irving sued the historian Deborah Lipstadt for libel in the English courts over remarks she had made about him in her book, Denying the Holocaust: the Growing Assault on Truth and Memory. With the burden of proof planted firmly in Lipstadt’s corner, she had to prove to a libel court that Irving’s claim that the Holocaust didn’t happen, was false. Now this trial is being brought to the screen with a script by David Hare, and a cast that has more than a little experience in bringing heavyweight drama to the fore. Weisz is a great choice to play Lipstadt (though she has replaced Hilary Swank in the role), and Spall looks both banal and creepy as Irving. 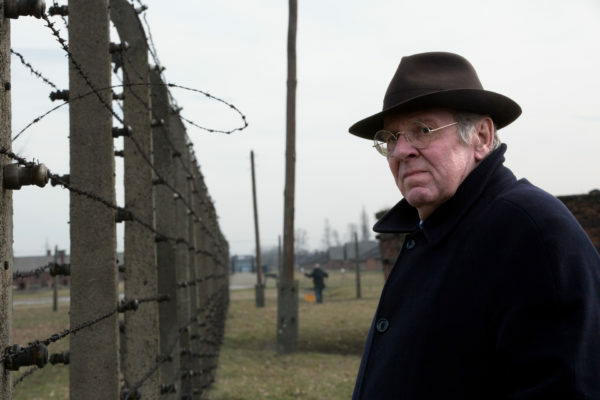 With its terrible historical background, Denial looks like it has the potential to be a thought-provoking, morally complex thriller that examines one of the more darker, and disturbing assertions made about the Holocaust in the last thirty years. If you’re John Lasseter, you’ve got to be feeling pretty satisfied with yourself and the state of play at Disney at the moment. Two out of the three last Disney animated releases have taken over a billion dollars at the international box office, and just in the last few days, the latest movie from Pixar, Finding Dory (2016), has broken all kinds of box office records including the largest opening weekend for an animated feature. Pretty sweet indeed. This must make the next Disney animated release another cause for (probable) celebration. However, this first teaser trailer for Moana doesn’t give anything away, and aside from some beautifully realised sea-faring animation, and a rather scrawny looking chicken as comic relief, there’s nothing to get excited about. Let’s hope Moana‘s first full trailer gives us something more to look forward to. Mike Flanagan is a name that most mainstream movie goers will be unfamiliar with, but if you’re a fan of horror movies and have been paying attention in recent years then you’ll know that he’s made a handful of features that have tried (and sometimes succeeded) in doing something a little bit different with the genre. Absentia (2011) was a quietly unnerving experience, while Oculus (2013), even though it didn’t work completely, was a stylish and clever exercise in combining two linear narratives to heighten suspense. With Before I Wake, the signs are that Flanagan has found a story that will play to his visual strengths as well as his ability to craft unsettling experiences out of everyday occurrences. And for anyone who thinks the child actor has a familiar face, it’s Jacob Tremblay, from Room (2015).